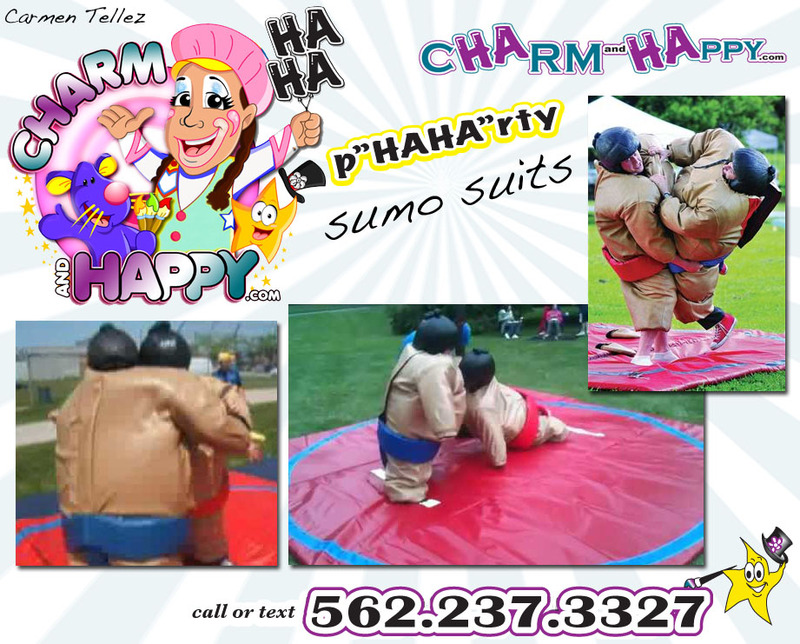 Teen Parties - Sports Theme - Events - Graduations - Adult Parties - Family Reunions - Not recommended for expected mothers or persons with bad back! Sumo Wrestling is one of the most popular interactive games in the world. Almost as fun to watch as it is to play. All Sumo Wrestling rules and traditions should be respected. Rental consists of two Sumo suits, two wig-style helmets, one 14'x14' safety mat, and two pairs of safety mittens. Fits 4.5ft. high and over teens and adults. 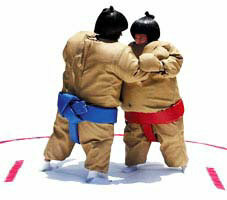 Sumo Wrestling has long been a favorite for company meetings, grad parties and a host of other special events. Two contestants put on oversized vinyl suits and are instantly transformed into gigantic Sumo wrestlers, complete with wig and miwashi diaper. The referee starts the match and the giant wrestlers try to push, pull and 'blubber' their opponent to the floor. The hilarious appearance of the overweight Sumo wrestlers might just bring the spectators to the floor, so watch out! This one is a real crowd pleaser! A safety waiver must be signed. An adult must be present at all times. HIRING AN ATTENDANT at parks - add Min. 3hrs pay @ $50ph. Attendant delivers and sets up Sumos for play, then stays to attend the game as a referee the contestants and announce the rules of the game to each. Attendant monitors safety. Unruly participants will not be allowed to play. After attendants time is complete, will pack up the sumos to leave. Attendant does NOT lift up participants from ground. El Segundo, Hollywood, San Fernando, the Valley areas, etc.